Cub Linux on 32GB USB Drive | Linux DVD Shop - UK Linux Shop supplying Linux on CD, DVD and USB with Free UK Delivery, 24Hr Dispatch. Cub Linux 32GB USB Stick is an Ubuntu-based Linux distribution that attempts to recreate the look, feel and functionality of Google's Chrome OS on a conventional desktop. Ubuntu updates are installed automatically, providing long-term security support. 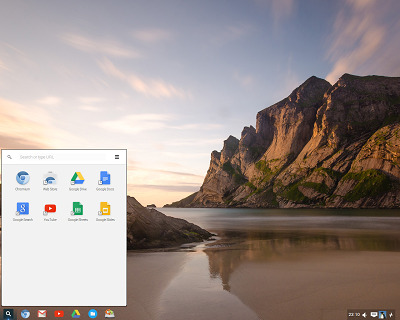 Chromixium combines the elegant simplicity of the Chromebook with the flexibility and stability of Ubuntu’s Long Term Support release. Chromixium puts the web front and center of the user experience. Web and Chrome apps work straight out of the browser to connect you to all your personal, work and education networks. Sign into Chromium to sync all your apps and bookmarks. When you are offline or when you need more power, you can install any number of applications for work or play, including LibreOffice, Skype, Steam and a whole lot more. Security updates are installed seamlessly and effortlessly in the background and will be supplied until 2019. You can install Chromixium in place of any existing operating system, or alongside Windows or Linux. Minimum requirements: 512MB RAM (1GB preferred), 1GHZ PAE/SSE2 capable Intel/AMD processor.